Absorbable polyester fibers, braids, and surgical meshes with improved handling properties have been developed. These devices are preferably derived from biocompatible copolymers or homopolymers of 4-hydroxybutyrate. These devices provide a wider range of in vivo strength retention properties than are currently available and have a decreased tendency to curl, in the preferred embodiement, due to the inclusion of relaxation and annealing steps following extrusion and orientation of the fiber. Filaments prepared according to these methods are characterized by the following physical properties: (i) elongation to break from about 17% to about 85% (ii) Young’s modulus of less than 350,000 psi, (iii) knot to straight ratio (knot strength/tensile strength) of 55-80% or (iv) load at break from 1100 to 4200 grams. The present invention generally relates to fiber-based medical devices derived from poly-4-hydroxybutyrate and its copolymers. Chemical synthesis of PHA4400 has been attempted, but it has been impossible to produce the polymer with a sufficiently high molecular weight necessary for most applications (Hori, Y., et al., Polymer 36:4703-4705 (1995)). Tepha, Inc. (Cambridge, MA) produces PHA4400 and related copolymers for medical use, and has filed a Device Master File with the United States Food and Drug Administration (FDA) for PHA4400. Related copolymers include 4-hydroxybutyrate copolymerized with 3-hydroxybutyrate or glycolic acid, as described in U.S. Patent No. 6,316,262 to Huisman et al. , and U.S. Patent No. 6,323,010 to Skraly et al. Tepha, Inc. has also filed a Device Master File with the United States FDA for copolymers containing 3-hydroxybutyrate and 4-hydroxybutyrate. Methods to control the molecular weight of PHA polymers have been disclosed in U.S. Patent No. 5,811,272 to Snell et al. , and methods to purify PHA polymers for medical use have been disclosed in U.S. Patent No. 6,245,537 to Williams et al. PHAs with degradation rates in vivo of less than one year have been disclosed in U.S. Patent No. 6,548,569 to Williams et al. and WO 99/32536 by Martin et al. The use of PHAs as tissue engineering scaffolds has also been disclosed in U.S. Patent No. 6,514,515 to Williams , and other applications of PHAs have been reviewed in Williams, S.F., et al., Polyesters, III, 4:91-127 (2002). In the practice of surgery there currently exists a need for absorbable fibers and surgical meshes with improved performance. For example, an absorbable hernia mesh with prolonged strength retention could have many advantages over the non-absorbable synthetic meshes currently used in hernia operations (Klinge, U., et al., Biomaterials 22:1415-1424 (2001)). Long-term implantation of these non-absorbable meshes is not considered ideal because they can lead to complications such as adhesions (fistula formation), pain, and restriction of physical capabilities (Klinge et al., 2001). If implanted into surgical sites that are contaminated or have the potential to become contaminated, 50-90% of these non-absorbable implants will need to be removed (Dayton et al., Arch Surg. 121:954-960 (1986)). These implants are also not ideal for use in pediatric patients where they could hinder growth (Klinge et al., 2001). To date, the use of absorbable synthetic surgical meshes in hernia repair has been found to almost invariably result in large incisional hernias that require revision operations because of the relatively short-term strength retention of these materials (Klinge et al., 2001). However, an absorbable hernia mesh with prolonged strength retention could solve this problem by providing a mechanically stable closure, which can reduce the incidence of adhesions and the risks of infection, and is suitable for use in pediatric patients. There are also needs for improved meshes and patches for other procedures. In pericardial repair there exists a need for a surgical material that will prevent adhesions between the sternum and heart following open- heart surgery. There are also similar needs to prevent adhesions in spinal and gynecology procedures that could be addressed with improved surgical meshes and patches. Biomaterial patches derived from animal and human tissue are currently used in cosmetic surgery, cardiovascular surgery, general surgery (including hernia repair), and in urology and gynecology procedures for the treatment of conditions that include vaginal prolapse and urinary incontinence. There is a growing concern about the use of animal and human derived biomaterials because of the risks associated with disease transmission. However, the synthetic absorbable meshes and patches that are currently available are limited, can be inflammatory, and do not provide prolonged strength retention. Thus there exists a need to provide new absorbable meshes for these procedures as well. Ideally, these products should have prolonged strength retention, induce minimal inflammatory responses that resolve, have good handling properties, provide mechanically stable reinforcement or closure, offer anti-adhesion properties (where necessary), minimize the risks of disease transmission, and after absorption leave a healthy natural tissue structure. Thus, there is a need to develop absorbable fibers with prolonged strength retention that could be used as suturing materials or as surgical meshes. In 1984, a division of Johnson and Johnson (Ethicon) first introduced a monofilament synthetic absorbable suture made from polydioxanone (sold as PDS™). This suture retains about 50% of its strength up to six weeks after implantation, and is completely absorbed in the body within six months. Davis and Geck subsequently introduced a monofilament suture based on a copolymer of glycolide and trimethylene carbonate (sold as Maxon™). This suture has similar strength retention to PDS™. Two other monofilament sutures were introduced more recently: one based on segmented copolymers of glycolide and caprolactone (sold as Monocryl™), and the other based on a terpolymer of glycolide, p-dioxanone, and trimethylene carbonate (sold as Biosyn™). Monocryl™ is reported to have a 20-30% breaking strength after 2-3 weeks, and is completely absorbed after 3-4 months. Biosyn™ has an absorption profile similar to Monocryl™. Despite continued innovation in the development of absorbable synthetic monofilament sutures there is still a need for a synthetic absorbable suture with extended strength retention for patients requiring long-term wound support. For example, a monofilament suture with 50% strength retention at 3-6 months (after implantation). There are also limited options for synthetic absorbable meshes with prolonged strength retention. U.S. Patent No. 6,548,569 to Williams et al. discloses that PHA4400 has a slower absorption rate in vivo than many materials used as absorbable sutures, and provides absorption data for unoriented PHA4400 films and porous samples. Methods to produce medical fibers and textiles from PHA4400 have previously been described by Martin et al. in WO 2004/101002 . These methods were successful in producing fibers with prolonged strength retention. WO 2004/101002 discloses poly-4-hydroxybutyrate polymer that can be converted into fibers and devices with tensile strengths comparable to existing absorbable synthetic fibers such as PDS but with prolonged in vivo strength retention. It does not, however, disclose pliable, curl free fibers with increased tensile and knot tying properties as compared to currently available absorbable fibers such as PDS nor methods to produce these important properties. It is therefore an object of this invention to provide new fibers, surgical meshes, and medical devices with improved handling properties and improved knot tying properties. It is another object of this invention to provide methods for fabricating the articles and devices. Absorbable devices such as suture fibers, braids, and surgical meshes with improved handling and methods for making these materials have been developed. These devices are preferably derived from biocompatible copolymers or homopolymers of 4-hydroxybutyrate as described in the present claims. The devices provide a wider range of in vivo strength retention properties than are currently available, and improved handling properties. The devices are processed using a method that produces a non-curling fiber useful as a suture. Properties are enhanced by the addition of a relaxation step following orientation and an annealing step. The relaxation and annealing steps are carried out at a temperature from 30 to 150°C and from 35 to 150°C, respectively. Introduction of an annealing process and relaxation step for the fiber further enhances the handling properties of the resulting fibers. The relaxation step allows the fiber to shrink and elongation is allowed to increase by as much as 25% followed by an annealing step either on or offline to further control and fine tune elongation, modulus and strength. The poly-4-hydroxybutyrate may additionally be combined with absorbable additives then processed through relaxation and/or annealing to further enhance fiber handling. In a preferred method, polymer fibers with improved handling and less tendency to curl are prepared by extruding the fiber, as described above, and then using an aging step whereby partially drawn polymer filament is stored from 2 to 72 hours at temperatures between 0 and -80°C before processing with hot stretching and annealing, as described above. In yet another preferred method, polymer fibers with improved handling may be prepared by blending up to 15% by weight calcium stearate, calcium phosphate or similar materials into the polymer and then melt extruding the polymer into the desired filaments. The filaments may be further processed by hot stretching and annealing, as described above. "Strength retention" as generally used herein means the amount of time that a material maintains a particular mechanical property following implantation into a human or animal. For example, if the tensile strength of an absorbable fiber decreased by half over three months when implanted into an animal, the fiber's strength retention at three months would be 50%. "Biocompatible" as generally used herein means the biological response to the material or device being appropriate for the device's intended application in vivo. Any metabolites of these materials should also be biocompatible. "Handling" as generally used herein means the ease with which a material or device can be manipulated, particularly by a medical practitioner. "Curling" as generally used herein means the tendency of a fiber to curve or form coils during handling. "Non-curling" as generally used herein means has a reduced tendency to curve or form coils during handling. "Pliable fiber" as generally used herein refers to a fiber with reduced stiffness. "Knot Conversion" as generally used herein refers to the ratio of knot strength to the tensile strength. "Knot Security" as generally used herein refers to the knot resistance to become undone. "Poly-4-hydroxybutyrate" as generally used herein means a homopolymer comprising 4-hydroxybutyrate units. It may be referred to herein as P4HB, PHA4400 or TephaFLEX™ biomaterial (manufactured by Tepha Inc., Cambridge, MA). 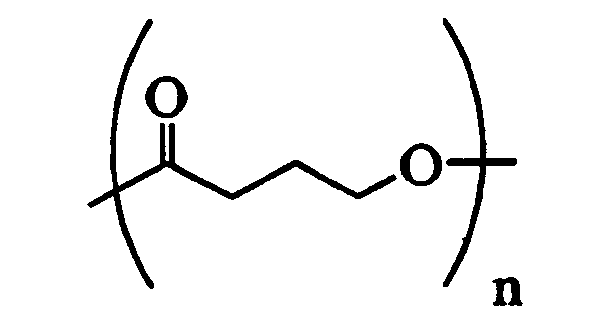 "Copolymers of poly-4-hydroxybutyrate" as generally used herein means any polymer comprising 4-hydroxybutyrate with one or more different hydroxy acid units. The filament may be formed from biodegradable polymers, such as poly-4-hydroxybutyrate (P4HB), and copolymers thereof, such as poly-4-hydroxybutyrate-co- poly-3-hydroxybutyrate (P4HB-P3HB) and poly-4-hydroxybutyrate-co-poly(glycolic acid) (P4HB-PGA). Tepha, Inc. of Cambridge, MA produces poly-4-hydroxybutyrate and copolymers thereof using transgenic fermentation methods. Methods of producing non-curling fibers with knot strength as high as 10 kg and improved straight to knot conversions (ratio of knot strength to tensile strength) have been developed. A polymer such as PHA4400 or copolymers thereof, is dried. Dried pellets of the polymer are melt extruded, then stretched in order to effect its orientation and thereby increase its tensile strength. The oriented fiber is then constrained between two godets and a heating media. The second godet rotates at a lower speed than the first, thereby allowing the fiber to shrink and relax. A third godet may be utilized before winding the fiber material. The relaxation step is carried out at a temperature from 30 to 150°C. In carrying out the annealing operation, the desired length of fiber may be wound around a creel, rack or skein and the wound material placed in a heating media maintained at the desired temperature to anneal the fiber. The annealing step is carried out at a temperature from 35 to 150°C. After a suitable period of residency in the heating media, the annealed fiber is then removed from the heating media and unwound. The resultant fiber is curl free, more pliable, has a higher knot strength and knot security. In a preferred method, polymer fibers with improved handling and less tendency to curl are prepared by extruding the fiber, as described above, and then treated with an aging step whereby partially drawn polymer filament is stored from 2 to 72 hours at a temperature between 0 and -80°C before processing with relaxation and annealing, as described above. In yet another preferred method, polymer fibers with improved handling are prepared by blending up to 15% by weight calcium stearate, calcium phosphate or similar materials into the polymer and then melt extruding the polymer into the desired filaments. The filaments may be further processed through relaxation and annealing, as described above. Filaments prepared according to these methods are characterized by the following physical properties: (i) elongation to break from 17% to 85% (ii) Young's modulus of less than (23,816 atm), (350,000 psi), (iii) knot to straight ratio (knot strength/tensile strength) of 55-80%, or (iv) load to break from 1100 to 4200 g. These fibers exhibit a reduced tendency to curl and better knot and handling characteristics. The filaments can be used to form a wide range of medical products, including suture materials, stable surgical meshes, synthetic ligament and tendon devices or scaffolds. These fibers, both monofilament and multifilament, can be used to manufacture sutures with prolonged strength retention, as well as fiber-based medical devices such as surgical meshes and braids. Properties that can be improved through the use of these methods to decrease curling are lower Young's Modulus and an increase in straight to knot conversion. Modulus values are important to surgeons since soft, highly flexible sutures are easier to handle, use and tie. Flexible and slightly elastic sutures are also desirable since they conform to the wound and permit latitude in the tension applied to the suture by the surgeon. The suture materials may be useful in the treatment of patients with diabetes, obesity, nutritional impairment, compromised immune systems, or other conditions such as malignancy or infection that compromise wound healing. Stable surgical meshes can be used in procedures, such as pelvic floor reconstruction, urethral suspension (to prevent stress incontinence using the mesh as a sling), pericardial repair, cardiovascular patching, cardiac support (as a sock that fits over the heart to provide reinforcement), organ salvage, elevation of the small bowel during radiation of the colon in colorectal cancer patients, retentive devices for bone graft or cartilage, guided tissue regeneration, vascular grafting, dural substitution, nerve guide repair, as well as in procedures needing anti-adhesion membranes and tissue engineering scaffolds. Further uses include combinations with other synthetic and natural fibers, meshes and patches. For example, the absorbable fibers and devices such as meshes and tubes derived from the fibers can be combined with autologous tissue, allogenic tissue, and/or xenogenic tissue to provide reinforcement, strengthening and/or stiffening of the tissue. Such combinations can facilitate implantation of the autologous, allogenic and/or xenogenic tissue, as well as provide improved mechanical and biological properties. Combination devices can be used, for example, in hernia repair, mastopexy / breast reconstruction, rotator cuff repair, vascular grafting/fistulae, tissue flaps, pericardial patching, tissue heart valve implants, bowel interposition, and dura patching. PHA4400 (Tepha, Inc., Cambridge, MA) (Mw 575K) was ground into small pieces using a Fritsch cutting mill (Pulversette 15, 10 mm bottom sieve) and dried under vacuum overnight to less than 0.01% (w/w) water. Dried pellets of the polymer were fed into an extruder barrel of an AJA (Alex James Associates, Greer, SC) 3/4" single screw extruder (24:1 L:D, 3:1 compression) equipped with a Zenith type metering pump (0.16 cc/rev) and a die with a single hole spinnerette (0.026", 2:1 L:D) under a blanket of nitrogen. The 4 heating zones of the extruder were set at 140°, 190°, 200° and 205°C. The extruder was set up with a 15 ft drop zone, 48" air quench zone (10°C), a guide roll, three winders and a pickup. The fiber was oriented in-line with extrusion by drawing it in a multi-stage process to provide fiber with high tensile strength and a reduced extension to break. The fiber was drawn in-line to stretch ratios of 6 to 11X. A spin finish (Goulston, Lurol PT-6A) was dissolved in isopropanol at 10% (v/v) and applied to the fiber before the first roll to act as a lubricant and protect the fiber during downstream processing. Molten polymer was then passed through a heated block to a metering pump and extruded from a die with a single hole spinneret. The block, metering pump and the die were maintained at a constant temperature, preferably 180-250°C. Pump discharge pressure was kept below 102 atm (1 500 psi) by controlling the temperatures and the speed of the metering pump. The resulting spun extrudate filament was free from all melt irregularities. The extrudate was then drawn in a heated tube, which was maintained at a temperature above the melting temperature of the filament, quenched in a water bath, drawn through multistage orientation, and hot stretched, using a heated tube oven or hot liquid, preferably water, without the filament touching any surface until it is naturally cooled. The highly oriented fiber passes through another heating unit maintained at a temperature from 30°C to 150°C. The second heat treatment results in online relaxation, or shrinkage of the fiber. In order to accommodate this online shrinkage the exit fiber speed is allowed to be less than the feed speed by as much as 40%. The relaxed fiber was wound on creels or racks and annealed for a preset time in an annealing media maintained at temperature from 35°C to 150°C. After annealing, the fiber was allowed to reach room temperature and tested. Example 2: Characteristics of Sutures prepared in Example 1. Tensile mechanical properties of the melt extruded fibers were determined using a universal mechanical tester. Surgical meshes were prepared with the sutures. Fabric construction was as follows: Mach #30 Raschel Knit 36 gauge fabric, 150 ends, 16 courses, 40 stitches per inch, using 18 needles per inch. Specifications for the finished fabric were: Weight: 58 g/m2 (1.72 oz/sq. yard), Thickness: 0.29 mm. A polymer comprising 4-hydroxybutyrate a copolymers thereof, having an elongation to break from 17% to 85%, a Young's modulus of less than 23,816 atm (350,000 psi), and a load at break between 1100 and 4200 g, and is producible by extrusion, orientation, relaxation and annealing. A polymeric filament comprising a polymer according to claim 1, wherein the filament has an elongation to break from 17% to 85%, a Young's modulus of less than 23,816 atm (350,000 psi), and a load at break between 1100 and 4200 g, and is producible by extrusion, orientation, relaxation to shrink the filament and annealing. A polymeric filament according to claim 2 wherein it is produced by extrusion, orientation by drawing the extruded filament to between six and eleven times its original length, relaxation to shrink and elongate the filament and annealing. The filament of claim 2 or claim 3 wherein the filament has an elongation to break from 17% to 85%. The filament of any one of claims 2 to 4 wherein the filament has a Young's modulus of less than 23,816 atm (350,000 psi). The filament of any one of claims 2 to 5 wherein the filament has a knot to straight conversion of 55-80%. The filament of any one of claims 2 to 6 in the form of a suture. The filament of any one of claims 2 to 6 formed into a mesh. The filament of any one of claims 2 to 6 in the form of a medical device. The filament of any one of claims 2 to 6 in the form of a device for repair of tendons or ligaments. The method of claim 11 further comprises constraining the filament during orientation and relaxation. The method of claim 11 further comprising an aging step wherein the extruded polyhydroxyalkanoate filament is partially drawn and is stored for a time period ranging from 2 to 72 hours at a temperature between 0 and -80°C. The method of claim 11 further comprising prior to step a) blending into the polyhydroxyalkanoate an additive selected from the group consisting of calcium stearate and calcium phosphate, wherein the additive comprises up to 15% (w/w) of the polyhydroxyalkanoate blend. The method of claims 11 to 14 further comprising forming the filament into a suture. The method of claims 11 to 14 further comprising forming the filament into a mesh. The method of claims 11 to 14 further comprising forming the filament into a medical device. The filament of any one of claims 2 to 10, wherein the polymer is poly-4-hydroxybutyrate. The method of any one of claims 11 to 17, wherein the polymer is poly-4-hydroxybutyrate. 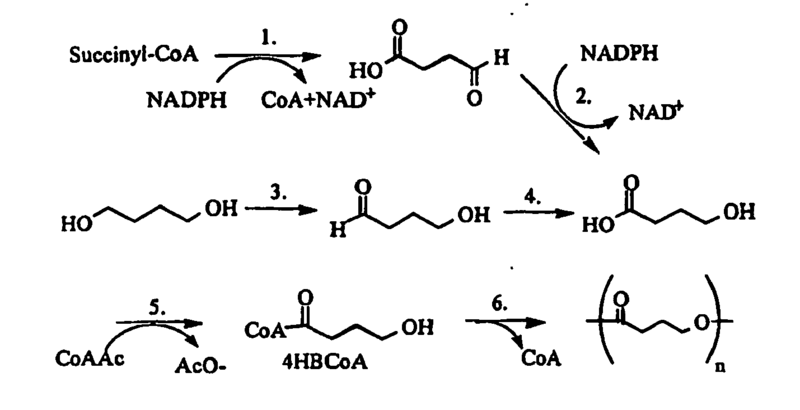 NL8603073A (en) * 1986-12-02 1988-07-01 Rijksuniversiteit Process for the preparation of polyesters by fermentation; process for the preparation of optically active carboxylic acids and esters; polyester comprising articles. DE59003337D1 (en) 1989-10-16 1993-12-09 Danubia Petrochem Polymere Pellet with retarded release. IT1247157B (en) * 1991-02-11 1994-12-12 Fidia Spa biodegradable and bioabsorbable guide channels to be used for nerve regeneration. FR2676927B1 (en) * 1991-05-29 1995-06-23 Ibf Microspheres used for vascular occlusions therapeutic injectable solutions containing them. CH689767A5 (en) * 1992-03-24 1999-10-15 Balzers Hochvakuum Process for Werkstueckbehandlung in a Vakuumatmosphaere and vacuum treatment system. MX9603065A (en) * 1994-01-28 1997-06-28 Procter & Gamble Biodegradable 3-polyhydroxybutyrate/3-polyhydroxyhexanoate copolymer films. ES2141953T3 (en) * 1994-08-12 2000-04-01 Minnesota Mining & Mfg Compositions pressure sensitive poly (beta-hidroxiorganoato) adhesives.